Retail investors are buying and selling shares through their mobile phones like never before. The average daily turnover through mobile trading in shares on the NSE jumped to a record 10.15 per cent of the total turnover or nearly Rs 3,700 crore a day in March 2019 from 3.6 per cent two years ago and 1.1 per cent five years ago. 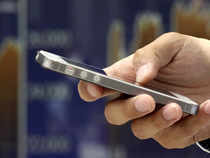 The ease of punching trades through a brokerage’s mobile application, affordable smartphones and cheap data plans have prompted several investors to switch to mobile phone transactions. “Our overall mobile app revenue has grown considerably in the past two years,” said Jaideep Arora, CEO, BNP Paribas’ Indian retail broking arm Sharekhan. For instance, 33 per cent of broking firm Motilal Oswal Financial Services’ retail clients trade on mobile phones in the cash market. The business has grown 81 per cent in the past two years. IIFL-backed discount brokerage, 5Paisa.com sees about 80 per cent of all trading happening through its mobile app with over two million users. For Zerodha, 60-70 per cent of the total turnover is through mobile trading. Such trades now account for anywhere between 30 per cent and 50 per cent of total orders at the top broking firms. The Securities & Exchange Board of India (Sebi) had allowed brokers to launch mobile trading in August 2010. Till then, a majority of the trades used to happen through brokerages’ relationship managers. Clients used to call up their brokers or relationship managers, who in turn would punch in their trades. These days, relationship managers get in touch with clients to only ensure timely payments. This arrangement works for brokers as mobile trading has helped them keep costs under control. The pick-up in trades through smartphones in the past two years can also be attributed to the stock market bull run between September 2013 and January 2018. Nitin Kamath, founder of Zerodha, said the average daily turnover through mobile trading on the NSE could be nearly 30 per cent if proprietary trading volumes are included. Brokerages said retail traders who are mostly using mobile phones are from the younger generation. A majority of them are from smaller towns across the country. The bigger growth in trading through mobile phones has been in equity futures and options. The NSE does not publish official data on derivatives mobile trading but broking officials said its way higher than volumes in shares. For instance, Sharekhan’s mobile trading revenues in shares have grown 150 per cent and in the derivatives segment by almost 230 per cent in the past two years. Broking firms expect the share of mobile trading volumes in overall activity to rise to around 50 per cent over the next two years.